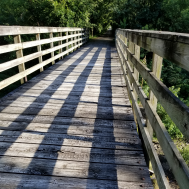 This linear park follows a route through the Cedar River bottomlands, along forested banks of the river and across fields where stands of trees are punctuated by open vistas. CVNT is an excellent place to observe wildflowers and abundant wildlife. Deer, woodchucks, wild turkey, and songbirds are among the creatures sighted along the trail. The northern part of the trail (about 25 miles) is a designated Important Bird Area, where various birds have been sighted. The northern stretch of the trail also includes pocket prairies or areas of native remnant prairies. Brush and other invasives have been cut back, and fire has been introduced to help rejuvenate these areas. Historical landmarks, large and small communities, archaeological sites and two restored railroad depots also add character to the trail. CVNT connects to the Cedar Valley Lakes Trail. The trail has an asphalt surface from Evansdale to McFarlane Park. nice long trail for bicycle riding! I did not post the above comment! If fully support you in this matter. The republicans have nothiyou. Keep up good work, Hillary. 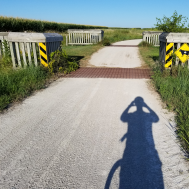 We rode a little of the trail to get to the RAGBRAI route.